At Casa Pedro, we pride ourselves on offering some of the best accommodation in Boquete. We recognize that all travellers have different accommodation needs, therefore we offer a variety of different rooms for any number of visitors. From our hostel rooms to our outdoor cottages we are sure to have something to suit your needs. If you don’t quite know which room you need for your size family or group, why not give us a call? We are always happy to help you book your ideal room accommodation, we can even offer you advice to help you organise all of your adventurous activities by planning your trip to include some of the best things to do in Boquete. A private suite with en-suite hot-water bathroom and private deck with superb views. Queen and twin-bed rooms with shared hot-water bath. A fully equipped large kitchen with all modern appliances. A living room with flat-screen TV. Sofa Bed for two people. If you are looking for hostels in Panama where you can come back and chill out after a day’s travelling or activities, we can provide you with the ideal accommodation and services. Have your meals on the table for when you return and get your clothes cleaned in our laundry room. We provide hot water, soft beds and electricity for a comfortable stay at our accommodation in Boquete. 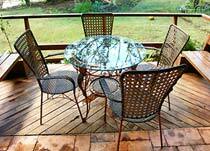 Casa Pedro also offers a separate cottage with full kitchen and hot-water bath that accommodates up to six people. Within this cottage, there is a queen bed, two single beds and sofa bed for two people. This is ideal for families wanting to stay all together in the same accommodation, as it’s more private and situated in a perfect location for family activities. Our family travellers have told us that our cottage provided the perfect place to spend family time together. Need a baby sitter? Casa Pedro also offers child care for both during the day and in the evening. We have a well-equipped children's play area perfect for entertaining your little ones whilst you go out and enjoy a short period of time by yourselves. Travelling as a couple? 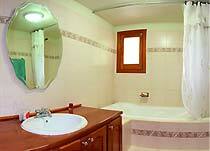 We offer a choice of rooms for different needs and budgets. If you are in need of a double room, you won’t find many other hostels in Panama like Casa Pedro that offer ideal rooms to accommodate you. 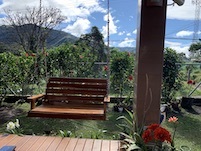 Surrounded by a romantic setting and activities to do as a couple, you will be able to sit and relax and enjoy each other’s company at our accommodation in Boquete. For more information on our rooms at our hostel in Boquete and our prices, please see our accommodation rates or contact us today for more information.